The Communion Veil: Beyond Forgiveness... a Challenge. In the session on Administering Justice the last woman to speak has stayed with me. She was obviously hurting and struggling with forgiveness. I think we all struggle with forgiveness, that is why we are human. I have no doubt, that to forgive on our own, there is probably a mathematical formula of forgiveness: a ratio of the offense committed against you in relation to the time it takes you to forgive that person. Smaller offenses have a shorter time to forgiveness compared to larger, more heinous crimes. But when the offense is great and would require an infinite measure of time to forgive, that is the time needed to forgive would be longer than we can live, then this is when our Lord gives us the grace to forgive. But we must forgive. Our Lord tells us we must, isn't this what we say in the prayer Our Father? "...forgive US our trespasses AS WE FORGIVE those who trespass against us." I beg you to take this seriously. We are forgiven AS we forgive...we cannot forget that. And if our small heart does not have the capacity to forgive, will not a God who loves us give us the ability to forgive so that not only we but the one who has done us wrong may be with Him? But I tell you the truth, we must go beyond even forgiveness. For He also said to "pray for those who persecute you..." So pray for those who do you evil. For by such prayer you are saying to God, "I love you, and I love you so much I don't want a soul that YOU love to be lost, even if he/she has done me wrong." How to pray for them? 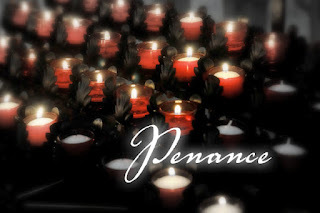 As in the last message of Fatima: "Penance, Penance, Penance!" We must be willing to do Penance for those who do us evil, also as a gift of love to God. "Jesus it is love for you, love for your Sacred Heart, love for the Immaculate Heart of Mary, that I offer this penance for the souls that you love, especially those in danger of hell-fire and I beg the conversion of sinners."